There are different ways to gain visibility for your blog and create a loyal audience that follows you every week. If you search the Internet, you will find all kinds of opinions on the topic. Some say that the most important is the SEO: getting links and optimizing your articles for keywords to promote high traffic. Others advocate networking, preferring to build relationships with fellow bloggers and grow based on interviews and guest posts. And there are those who advise commenting on blogs and forums on your topic, being active in the social networks or buying ads on Facebook. Create epic content for readers week after week. In this article I want to explain this type of content, what its benefits are, and how to create it. In addition, I will share with you the exact formula I use to write my blog posts. I hope to bring something new to you and help you take your online project to the next level. We will analyze it in detail so you’ll understand exactly what I mean. On the one hand, the epic content should be useful content. Readers come to your blog with a problem and your article gives them the solution they were looking for. In addition, it should not be merely a solution, but a solution that can be implemented that works so that they will be successful. Ultimately, your goal is to create something so extremely useful it changes their lives. Literally. They inspire to act and do something different as a result of reading it. This is what makes the difference. Because if someone follows your advice and will recommend you, word will spread and you will develop faithful followers forever. The problem with the word “useful” is that it is very subjective. What is useful for me may not be for you. So you must make sure that the content you create is useful to your audience. In general it is a good sign that your content generates polarized opinions, appealing to both people who love it as well as people who hate it. What we must avoid at all costs is to stay in no man’s land, and just publish something that is middle ground, satisfies everyone, and tries not to offend anyone. Producing quality content is difficult and requires a lot of work. An epic post can easily be 2 or 3 times longer than the typical post that does not add anything new or substantial to the reader. However, that extra effort is always worthwhile because eventually it will produce results 10, 50 or even 100 times better. Inbound links – People naturally tend to link to those posts that have helped them or links that they see as a reference. Exposure in social networks – When someone likes what they read, they share it with their friends and followers . Traffic – Links from other blog. Sharing on Facebook , Twitter and others creates constant exposure and hits from new visitors. In addition, they improve your positioning in Google (SEO). Subscribers – Epic posts, the ones that manage to excite the reader and make something click in their head, may be the trigger to take the next step and become a subscriber. Confidence – As I explained earlier, there is no better way to engage your audience. Make a life change (for the better) and you’ve got a lifelong fan. To give you an idea of how valuable it is to produce quality content, I invite you to take a look at my article on How to Set up a Facebook Ad in 5 steps . This post alone has brought me more than 10,000 visits in 6 days and hundreds of subscribers, some of which have ended up becoming customers. In deciding the theme of your epic post, the most important thing is that you always have your readers in mind. What do they want? What are their problems? Remember that you are writing for them, not for you! Usually the best way to find this information is to ask them directly, and a great place to do it is in the welcome e-mail you send them when they subscribe to your mailing list . I, for one, ask all my new subscribers what it means for them to “live a passive income lifestyle” and what is the biggest obstacle preventing them from doing it. Sometimes, I also send a survey directly to all members of my newsletter, or I will personally contact a commenter on a post. In all three cases, the answers I have received have inspired me for many posts. If you’ve just started and still do not have access to direct feedback from your audience, here is a method that works very well for me to find good ideas. Write about a general topic and ask questions that allow you to discover possible problems and interesting opportunities. You see, the possibilities are limitless. Just have a little imagination and put yourself in the shoes of your readers. Although the posts I write about cover all kinds of internet marketing topics, most follow a similar structure. It’s a formula that has been refined over the years and it works wonderfully for me. Today I will reveal it here first. The most important part of any article is the title, because that is what will determine whether your readers ignore your article or read it. If the title is not attractive, no matter how good the content, it will never be read or shared. Therefore, a good title is one that strikes the reader, either by mentioning the main benefit that they will get if they read, or arousing their curiosity in some way. If you are clever, you may have noticed that the title of this post uses both techniques. It clearly states what you are going to gain you if you read it (woo your readers and grow your blog) and also appeals to your curiosity by mentioning a ‘proven formula’ but does not reveal what it is. The introduction includes paragraphs that goes from the beginning of the article to the first subtitle, and is a key part that some writers do not usually give it the importance it deserves. Like the title, the aim of a good introduction is to convince the reader to read on. And for that you have to explain again the benefits that the reader will receive if they give valuable minutes of their time to your blog. Arouse their curiosity. With an interesting personal history that the reader will feel identified with (this is also ideal for connecting with them on a deeper level). With an explanation of what it is that has brought you to write this article. Then, finally, explain in a clear and direct way what the rest of the post will be and what someone can gain if they read it. After the title and the introduction comes the body, which is the post itself, which will finally give the reader all that you have promised so far. Many people come to this point and get directly to writing about the solution, but in my opinion that’s a mistake. The secret is to begin establishing a context for the solution. This is similar to an introduction to the body, in which you explain some previous aspects: what it is you’re about to get, where it comes from, why it matters, and why it works. If you notice, that’s exactly what I did in this post. I did not go directly from the epic intro to creating content, but I first told you what this type of content is and what its benefits are. Once there is context, the reader is ready to meet the solution itself. The key to writing a good solution is to understand that your goal is not only to explain best how to deal with the problem at hand, but also to get whoever is reading to implement your advice. That’s how you get positive results and loyal followers. Make it easy for the reader – Explain exactly what to do and how, so that they can implement immediately. Be pragmatic – Avoid abstract advice and phrases that sound very good but will do nothing in reality. Stick to what works. Anticipate objections – Put yourself in the place of the recipient and think about how you will react to what you’re reading. What consequences are going to occur for action or inaction? What questions will come your way? Try to answer them and counter them in the article itself before they come up. Add a touch of inspiration – People’s own experiences and the stories of others who have already successfully implemented your solution are a great way to encourage people to act. Finally, after the body has concluded, we reach the end of the post. The objective of this section is to briefly summarize the most important points that you dealt with in the rest of the article and leave a good impression. This second part is very important. Many times posts have a sloppy finish, as if the author had been bored before writing the end. This leaves a bad impression. It reduces the chance that the reader will share the article, put into practice what they learned, or subscribe to the blog. Therefore, you should avoid it at all costs. My recommendation – and what I have done – is trying to close with a powerful phrase. It can be a motivating quote, or a powerful question, it leaves a feeling that the post is complete. Finally, after the conclusion there should be a call to action. I explain to the reader what the next step to be taken should be. For instance, you may ask readers to share the article with their friends, to answer any questions in the comments or to subscribe to your blog if they liked what they read, but never let your conversations end there. Although the structure and content are the most critical aspects in creating an epic post, there are some important additional considerations that you as the writer should understand. Writing an article for a blog is not the same as writing a novel. They are very different. Therefore, you should use a different writing style for your blog. Use short paragraphs – Nothing is worse on a website that a giant block of text that fills the screen. Not only is it aesthetically ugly, but it removes the desire to read. Get use to using paragraphs of up to 6-7 lines maximum to make the information more digestible and improve the reader’s experience. Divide the text into subtitles – For the same reasons stated in the previous section, it is also convenient to use subtitles to separate each group of paragraphs. It is not only more pleasing to the eye, but it helps to distinguish between the different sections of an article. In addition, it facilitates navigation through the text, and you can go directly to the part you need without having to read through everything else. Leverage lists – It may seem silly, but use the list (bulleted and numbered) function. This allows you to structure the ideas of a post in a clear and orderly manner and it also reads very well. Use them whenever you can! There are more, but these three are the most important. There is a belief that it is better to write posts to accommodate short attention spans because people browsing the Internet don’t want to read long narratives. I do not know if this is true. But imagine you have frequent headaches and while looking at Google one day, you get a 10,000-word article on how to end the headaches once and for all. Would you read it? Yes, and perhaps if it had twice as many words, you would read that as well. Anything to solve your problem. Well, that is my position in this debate. I think that writing long articles is not a bad idea, because if you bring really useful information, your readers will read it and they will be delighted to do so. In fact, if you deal with any subject in some depth, especially in an epic post, it is difficult to keep the text short. However, it makes no sense to add unnecessary words just to brag. The rule here is: make your articles as short as possible, but without leaving out anything that is essential and adds value to the reader. Just as short posts are not better or worse than the long ones, posting every day is no better or worse than publishing only once a week. In my opinion, the appropriate frequency of publication for a blog is closely linked to the length of the posts. If your articles are long and deep, it makes no sense to produce a new one each day. Your readers do not have time to assimilate each post. However, if you write small pearls of wisdom as does Seth Godin, you can post from Monday to Sunday and no information gets lost. In short, publish more or less frequently depending on the length of your articles and, of course, your goals and personal circumstances. To me a long post has done well with either one or two per week. Creating epic content for your audience is very laborious. But it is worth it, because you are creating an asset that will get you links, traffic, and subscribers for years. In this post I’ve shared with you all my secrets so you can also write compelling posts, but there is something I cannot do for you: write. So I invite you in the coming weeks to try to follow my advice, post several epic items, and see what happens. How do your readers react? How many visits and comments do you receive? How many shares? What tricks do you use to create epic content? Do you think making that extra effort worth it? Tell us in the comments! These are great tips, thanks so much for sharing! Thank you for the awesome tips! I started blogging last November and am always reading on how to improve my content. These are great tips. Thank you so much! Great tips! I need to just remember to add the inspiration part. I’ve always been on the fence when it comes to long blog posts. But you are right, just have to be sure to not leave anything essential and still keep value. Content is king, you are so right! I won’t write or publish a post unless it adds value to my readers. You are SO right. Making your content the best it can possibly be, the most comprehensive, the most useful to your readers, is the best way to ensure success, and great search engine results too. This is great advice. I’m pinning it to revisit. Great post! I read somewhere that the average internet user scans instead of reads a post, hence the usefulness of bullet lists and subheadings. I know this is true in my case, I don’t usually read long posts. You recommend to keep the post as short as possible without leaving out any essential information. How do you personally go about this? Do you draft a post and then trim it? I’d be interested to know about your writing process advice. Great tips. I usually scan post to get to the “High Points” so I am fully aware of how accurate this is. No one wants to read a 1000- 2000 word post that is just one block of text. I’m so glad that you said it’s okay to post once a week versus every day. I’d rather have 10 epic posts than 100 mediocre ones. I use to post everyday on one of my niche specific sites and I burned out quickly. After a few months I started posting 2 times a week and my articles became better and a weird thing happen, my traffic skyrocketed and so did my profits. Me too! I post once a week because I can’t do anything more than that with my busy life. I’m glad that it’s okay to do so. Sometimes I feel like I’m lagging behind because others are pushing out content like crazy. Such a great post thanks for sharing! You make it sound easy! I need to bookmark this – there’s no way I can absorb it all in one sitting. Thanks! Great tips! Someone once said to me, find the problem that people are trying to solve and help by offering solutions. That’s gold! That’s what people are trying to find in all the stuff out there. I am always on FB groups and forums reading posts and trying to see what others are struggling with. Once you figure out what they need help with, you can google solutions and create a post. After you create the post you can send them to your site for the answers to their problems. If you do this often your traffic and profit will skyrocket. I love that you talked about consistency (whether once a day or once a week). That’s key. Great post!!!! Very useful information. I have to bookmark this so I can reference to it whenever I need to. Thanks for the info! Already bookmarked this! This is great! A great article. One of the best articles I’ve seen on writing an epic post. Epic post Brian! For me, I can’t see the point of blogging for the sake of it. I try to make mine useful, and offer what I know in an entertaining and informative way. I don’t always have time to read long posts – so I save them to read and digest when I have more time. Great post on the structure of epic content. I love the way you set up the hierarchy of the components … they make sense. Thanks! Great post here Brian, Very informative. 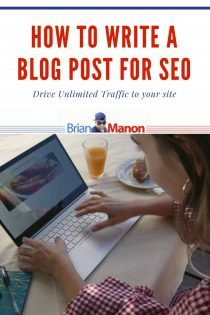 I do have to say that I would tend to lean towards a post that is around 2000 words or so max for the length because that is the way that I was trained. When we are online we all tend to get a little A.D.D and we love to bounce from one post to the next. But great post and I loved hearing your take on things Thanks! Yep, I totally agree. I post once, maybe twice per week to my blogs but they are impactful, useful posts. I just can’t stomach something posted just to say something got posted. Awesome post here man! Felt like I was in Wikipedia. Powerful post and I love the title. You can turn this into an ebook and sell it. Keep it up! My blog is still fairly new and I am trying to grow my followers. Thanks for posting these insights. This is gold. I will save so that I can reference it again later. I post only once a week, but I try to make the posts epic in content. “The rule here is: make your articles as short as possible, but without leaving out anything that is essential and adds value to the reader.” I love this… I need to print this out and put it at my desk! This helps so much! Much appreciated!! Great advice Brian! Will use many of your tips! These are all great things to ensure that a blog post becomes an epic posts. Thanks for sharing your expertise. There are some great tips and some I’m not currently doing so this is great to help me in the future, thanks so much for the info! Okay, I needed this inspo today. Started a new full-time job and I didn’t post last week because I was just so tired and busy! Great points! Especially about style. Great tips. Summed up so well. I’m also a fan of posts that have some bold text to highlight key messages. It helps time-crunched readers who’d just want to skim thru stuff they know and focus on areas they don’t. Great post! I’m in my first month of blogging so it’s extremely helpful! Yep, gonna have to bookmark this so I can keep coming back to it. Really good stuff in there. I only have time for one post a week so I’m glad to have the reassurance that it’s okay! I love your tips on the introduction for your post. Thanks! Very in depth and helpful! Thanks for sharing this! I like the posting once a week part – that has helped me tremendously! Great info. Definitely coming back to read it all again. Wow, this is amazing advice. I am truly thankful to you for writing this. I’ve been trying really hard to create epic content. It’s so hard but I keep at it. I feel that one day I’ll get there, the key is not to give up. Excellent tips. I believe epic content that gives value is worthy enough for extra efforts! publishing once in a week goes fine. This is how do it. This is very informative. I am going to try these tips in my next blog post. I try to post 3 times a week. I think I will make the first post epic and then follow up to that one with two more to expound on the epic one even further! A lot of this sounds like stuff I would have used in my English class to construct a paper. I suppose it’s even true for this medium. I never really thought of that. Love this! Definitely saving it to reference in the future! These are great suggestions for a newbie such as myself. I am slowly learning the ropes and the first lesson was making sure I have a catchy title.